"Heroic deeds, epic duels and a lavish masquerade ball all come to life in a huge, outdoor adventure for all the family. 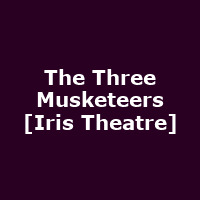 It's 1626 and a young d'Artagnan sets out for Paris, determined to join the King's Musketeers. There's just one problem, women aren't allowed. Undaunted, our heroine disguises herself as man and manages to befriend the legendary Musketeer trio Athos, Aramis and Porthos. The four fast friends are soon caught up in deadly plot involving the Queen, twelve diamonds studs and the safety of the entire French state. Will this mean war with England? Will all four of our heroes survive? And will anyone discover d'Artagnan's secret?"